Our journey through the world of classic cocktails continues. This time, we make Planters Punch. 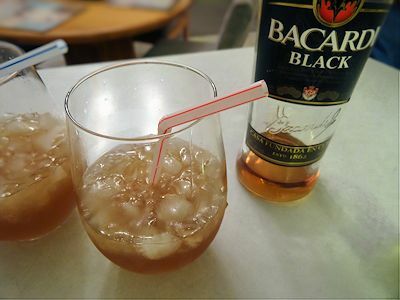 First, I put the rum in the glasses. I added sugar syrup. Next was the fresh squeezed lime juice and bitters. Put 2 inches of crushed ice into the glass and stir until frost forms on the outside of the glass. Add more ice to take it back to 2 inches. Put in a shortened straw and serve. This has a nice rum flavour that is moderated by the lime juice and ice. Add to the nice taste the icy cold from all the ice and it is a perfect drink for a hot day. Don’t worry about the amount of rum. Mix rum, simple syrup, lime juice and bitters in a glass. Add 2 inches of crushed ice and stir until frost forms on the glass. Add more ice to top up to 2 inches.